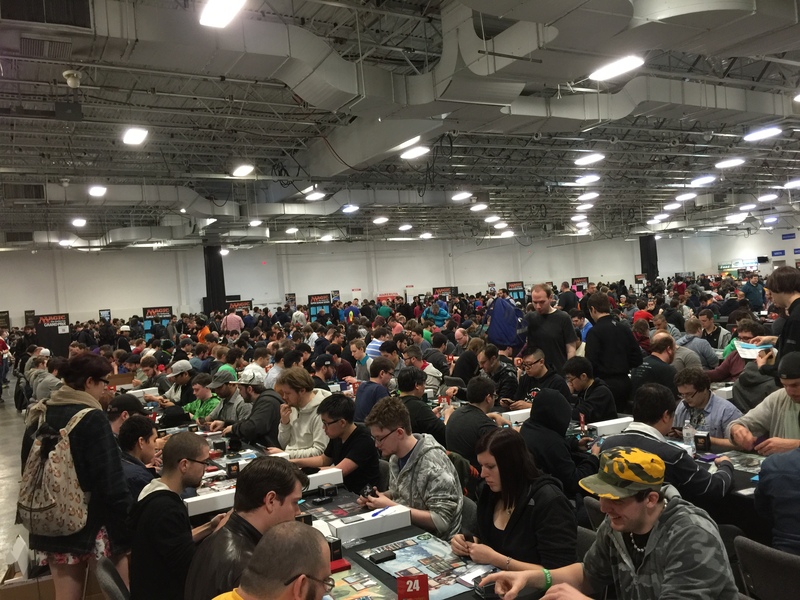 It’s time for the third and final installment of my tournament report on GP New York! Whereas my role on Saturday involved going deep into the logistics of handling decklists, Sunday presented me with an entirely different set of challenges as the Head Judge of the Super Sunday Series. First, a bit of background about the Super Sunday Series. (If you’re a grizzled Grand Prix veteran, feel free to skip the next few paragraphs.) The Super Sunday Series, or SSS, is one of the biggest events on the last day of a Grand Prix. The winner of each event not only qualifies for that year’s Super Sunday Series Championship, but also wins a trip to Wizards of the Coast headquarters in Seattle, where the championship is held. The significance of this prize necessitates running the event at Competitive REL. In the past, many TOs ran two distinct Super Sunday Series: usually one Sealed, and one in a Constructed format. In order to crown a single winner, the top four players from each event advanced to a special Top 8 draft. Since Swiss rounds are designed to produce a Top 8, each individual tournament played an additional round (“Swiss+1”) to try to create a fair Top 4. Unfortunately, running two tournaments that merge together means you’ve imposed a harsh start condition on your Top 8 playoffs. Although the two events’ starting times were scheduled so that they would theoretically end at the same time, that rarely actually occurred, leaving players (and judges) waiting around for the other event to wrap up. Not a great customer experience. Although I’m not privy to the exact reasons, I’m confident the issues I listed are a big part of why the dual-SSS format has largely been phased out. These days, it’s much more typical to have just a single Super Sunday Series, with the normal number of Swiss rounds and a simple Top 8. This was certainly the case at GP New York, and I was quite happy about that. As with any side event at a Grand Prix, one of my biggest challenges was making sure the correct number of judges were covering the event at a given time. While having too few judges leads to delays in answering judge calls and other issues, too many is also a problem, as the excess judges could be better utilized elsewhere on Sides. I’ve also found that feeling overstaffed can lead judges to act more complacently and hustle less, although that certainly varies based on the judges involved. 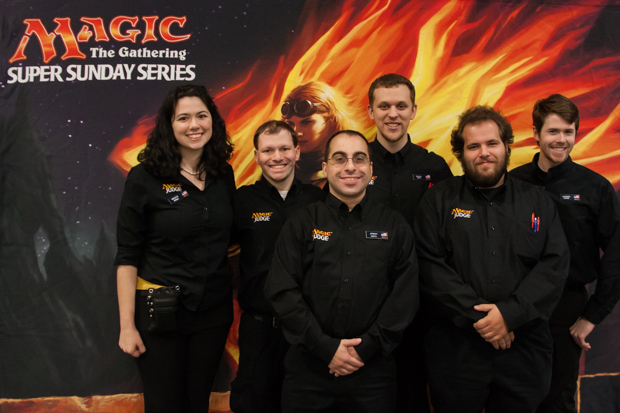 For GP NY, five judges were assigned as “core” SSS judges: Nicolette , Johnpaul , Philip , Jeremy , and Brandon . I knew I’d be relying on this group as my foundation, as well as picking two of them as my team/task leads. While we could easily handle a 150-person event (or perhaps even larger) by ourselves, we’d certainly want more judges if the event approached the 300- or even 400-player mark. Moreover, those extra judges would have other duties and responsibilities, so they would probably be flowing into and out of the event, perhaps not always predictably. All in all, this meant that whatever organizational structure I established would need to be flexible enough to accommodate both an uncertain number of players and a variable number of judges. So instead of setting up a lot of brittle systems that might break or need to change, I decided to provide very minimal structure ahead of the event. While some of these choices were slight, they added up to a significant departure from how I usally organize other similarly-sized Competitive events, such as an SCG Classic or the upcoming Eternal Extravaganza. For those events, I frequently plan a break schedule ahead of time, and often send everyone a big email about my expectations. For this event, however, striving for a more flexible and open structure was absolutely the right choice. The major risk and downside of this decision was that I shifted a lot of responsibility to Nicolette and Johnpaul. Fortunately, they’re both incredible judges and they both knocked it out of the park. I’m getting a bit ahead of myself, though. Let me back up a bit by saying that, as it turned out, we only had about 200 players for the SSS. (My theory is that the low attendance was due to poor weather on Sunday, combined with a fairly early 8:30am start for the event.) This meant that we wouldn’t need too many judges beyond the “core” SSS staff…for most of the day. However, there’s always one part of a big Sealed event that can use all the help it can get, and that’s the player meeting/product distribution. Fortunately enough, since there wasn’t much else happening at the start of the day, we had plenty of help from the other side event judges. Another big asset in our favor was that ChannelFireball and the Thursday set-up crew had already packaged everything that each SSS player needed to receive (booster packs, GP playmat, GP promo, blank decklist, and so on) into a single longbox. This simplified our task from handing each player four distinct objects to giving them just one. Johnpaul handily organized and rallied our extra troops, and the player meeting began with minimal trouble. As for the player meeting itself, it went off pretty much without a hitch. The new procedure for opening and registering Sealed product is wonderful; it’s great that players keep the cards they open, and no longer have to worry about dropping from the event in order to keep a valuable pool. Their only downside is that the process has to be done just so, which necessitates clear announcements. This was something I had very much in mind when preparing for the SSS, and overall, I believe my instructions were clear without being overly verbose. However, I did make one mistake. When informing the players which half of them should open their packs first, I simply said that players facing the main event stage should open first. While unambiguous, this instruction didn’t drive home that the other players should not open their packs just yet, and some of them started doing just that. A better idea would have been to ask the players facing the side event stage to all raise their hands, which would have provided a stronger visual division between the two groups. My other regret from the player meeting regards time limits. After my past few experiences with Sealed events and the new procedure, I was concerned that players wouldn’t be able to register their pool in the allotted 20 minutes. (OK, when I say “their pool” I really mean “the pool of the person sitting across from them,” but that’s awkward to write out all the time.) So I spontaneously upped the time limit from 20 minutes to 25 minutes as I was making my announcements…which meant I had done so without telling Nicolette, who had already prepared the clock to count down from 20. Although she and her team adjusted things without too much trouble, it was definitely an awkward moment. And, as it turns out, basically everyone managed to finish registering within the first 20 minutes, which meant the extra 5 minutes were pretty much wasted. Lesson learned: Trust the MTR! The event itself went quite smoothly. Although our scorekeeper was up on the main event stage, I spent most of my time on the floor. This let me interact with the SSS judges a lot more frequently, and I even ended up taking a couple calls myself. The most notable of these resulted in me assessing USC-Minor to a player who was particularly antagonistic to his opponent during the judge call; I promptly pulled that player away from his table and explained the boundaries of what is and isn’t acceptable to say to your opponent. One of the most amusing stories of the day involved a player who lost his deck and simply couldn’t find it, even after checking lost-and-found. I told him that we could provide him with his decklist and he could try to recreate his deck from scratch, perhaps by getting cards from the donation box at On-Demand Events, and otherwise from the vendors. Amazingly enough, he actually managed to find all the cards he needed before 10 minutes into the next round had elapsed, so he was able to avoid any Tardiness penalties and continue playing normally! Due to the way shifts were set up, I didn’t actually finish the event before leaving the venue for the day; that fell to John Temple , who (of course!) did a great job. I’m somewhat unused to transitioning the Head Judge role of large tournaments: it doesn’t come up that often, but it’s an important skill nonetheless. If I get the chance to head judge an SSS or similar event in the future, I plan on touching base with my replacement before the event even begins, as well as more often during the event. On the whole, head judging the SSS was a fantastic experience, and a wonderful way to wrap up my hometown Grand Prix weekend. I was honored to lead a very talented staff of judges and put on a fun event for all our players! I can’t wait for the next time.